Norwegian researchers are working on mapping the geology of Jan Mayen Island, Norway's most northwesterly territory. In the process, they also found ruins from Atlantic City, an American base from the Second World War. During the Second World War, Jan Mayen Island was the only part of the Kingdom of Norway that the exiled government in London had full control over. Norwegian researchers recently found an old reminder of these times. These days, Jan Mayen is much more peaceful than it once was, and is mostly a home for researchers on extended research stays, as well as the personnel who live permanently on the island and maintain the research station. Astrid Lyså and Eiliv Larsen from the Geological Survey of Norway (NGU) spent the autumn of 2015 on Jan Mayen. Their primary job was to map the island's geology, and how its climate has changed during the last few thousand years. As part of this work, they investigated the floor of Nordlaguna, a lake on the island. For this work, they had assistance from Martin Ludvigsen and Kristina Anjar from the Norwegian University of Science and Technology's (NTNU) Centre for Autonomous Marine Operations and Systems (AMOS) research centre and the NTNU University Museum. This was the first time that the lake bed was examined using an automated underwater vehicle, an AUV, which systematically examines and maps the floor of the lake. You can read more about that research here. As the researchers examined their measurements, they turned up some unexpected objects. A boat-like shape showed up on the AUV's scan. To examine it more closely, the researchers used the University Museum's underwater ROV to film the site of the find, confirming that it was a small rowboat. This rowboat dates from the island's role in the Second World War. When the Germans invaded Norway's mainland in 1940, Norway had already had a weather station on Jan Mayen for several decades. Meteorologists continued to send weather reports from the island, but sent them to Great Britain instead. The station was shut down and partly destroyed by the Allies in 1940, because Germany could have also taken advantage of the weather reports. In fact, a German ship was sunk by the British in November of 1940, in an effort to take the island. But it didn't take long before the Allies found that they needed weather reports from Jan Mayen— or "Island X", as it was code named. Thirteen Norwegian soldiers came to the island from Iceland in 1941, which means that with exception of a few months during the first winter of the war, Jan Mayen sent weather reports for the duration of the war. Norwegian soldiers spent a significant portion of the war defending the island, as weather observations from Jan Mayen were important to the Allies' supply convoys to Murmansk. As many as 52 Norwegians were stationed here at a time during the war. Nordahl Grieg, a Norwegian author, spent several weeks on Jan Mayen in 1942 and wrote the poem "Øya i Ishavet" (Island in the Arctic Ocean). Even General Carl Gustav Fleischer, who led Norwegian troops in retaking Narvik, spent a few days at the station on inspection. After the 1940 attempt, the Germans never really made an effort to take the island. German planes passed over Jan Mayen from airports in Værnes and Banak, but this was mostly for reconnaissance and weather checks, so the personnel on the island were rarely threatened. But it certainly was considered. When the Allies wanted to use the base on Jan Mayen as propaganda,Commanding captain 'Fritz' Ulstrup protested because it would indirect putting the crew on the base in greater danger of attack. "I don't mean to say that an attack or two would be harmful to the garrison— it could be a good change of pace," Ulstrup said. "However, the goal of the station on Jan Mayen is to act as a meteorological service, and this task should not be hindered by showing off the island to German eyes and ears." Despite their half-hearted interest in the island, two German planes crashed on Jan Mayen in 1942, with a total of 13 dead. At least one of these planes was intended to bomb the Allies, but was unsuccessful due to bad weather and crashed. The other plane was not found until 1950, and none of the island's inhabitants were aware of it until the crash site was located. The weather can be rough on Jan Mayen. The Germans thought that there was a fighter jet base on the island, because they kept losing planes over it. A plan was made to attack Jan Mayen with five ships in October of 1942, but the attack was cancelled after reconnaissance showed that they had too much to lose. And although they may not have realized it, it was the weather that was causing German planes to crash, not Allied fighter jets. One Norwegian died on Jan Mayen during the war, but it was in a canoe accident on Nordlaguna, not as the result of any fighting. Although the Norwegian who died on Nordlaguna was never found, the rowboat that was recently found by NTNU researchers tells the story of a subsequent event. The Americans showed up on Jan Mayen in 1943 and built a radio surveillance station. They called it "Atlantic City", choosing a grand name for what was essentially a group of barracks. The goal was to locate and take out German radio and weather stations on Greenland. The Germans had four of these stations, all of which were eventually located and taken care of. Atlantic City was able find stations on both Greenland and Svalbard, but was unable to find the station that the Germans built on the northern end of Jan Mayen, on the other side of the central volcano Beerenberg. The Germans destroyed this base themselves after allies on Iceland discovered it. The Norwegian government gave its permission for the Americans to build the station, but to avoid giving the Russians an excuse to increase their presence on Svalbard, this permission was only given with the agreement that the station would be taken down as soon as the war was over. For this reason, Atlantic City was abandoned in 1946. The Americans left, and the wind took over. 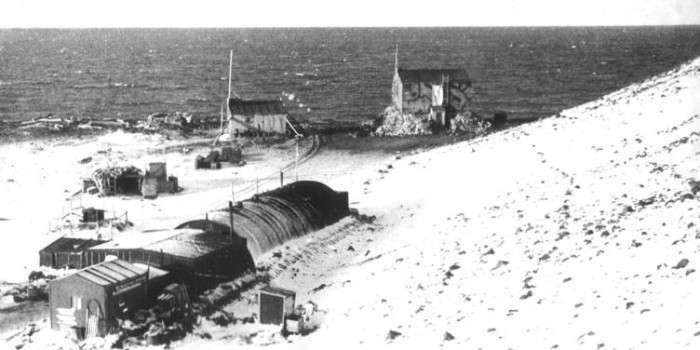 According to Susan Barr's book about Jan Mayen, the whole camp was blown into Nordlaguna during a storm on 28 September 1954. Atlantic City was swallowed by the sea. A keel boat was blown to sea as well. 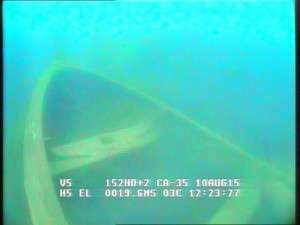 This is likely the boat recently found by the NTNU research team. "We were reading (Susan Barr's) book while working, and found a piece of the puzzle," says Professor Martin Ludvigsen from the Department of Marine Technology. He was part of the group that mapped Nordlaguna using the underwater robot. All that's left of Atlantic City today is ruins. Two buildings are still standing, a rotten sauna that is used as a boat house, and another sauna that seems to have been built more recently. And a few rusty wagon wheels. "There is also a run-down log house, and a cabin called Andersenhytta, which was used by an early fur hunter in 1907. But none of these buildings can be directly connected to the American war efforts or Atlantic City," says Professor Ludvigsen. Today, almost all of Jan Mayen is a protected nature reserve. There are strict rules regarding the use of the island. Researchers are studying the island to understand how the climate changed thousands of years ago. But traces of less peaceful times remain here as well.